It’s a given fact that most people in the world love to listen to music. So when you’re in public and you’d like to listen to your music without disturbing the other people around you, what do you do? Rather than blasting music through the speakers of your phone or other mobile device, earbuds have created a seamless way to enjoy what you love. Now the issue arises: which earbuds are right for you? There are so many different brands in the world and many of them can be incredibly costly for the quality they promise to offer. People spend hundreds on earbuds in their hunt to find sets with quality. But they don’t have to be expensive. 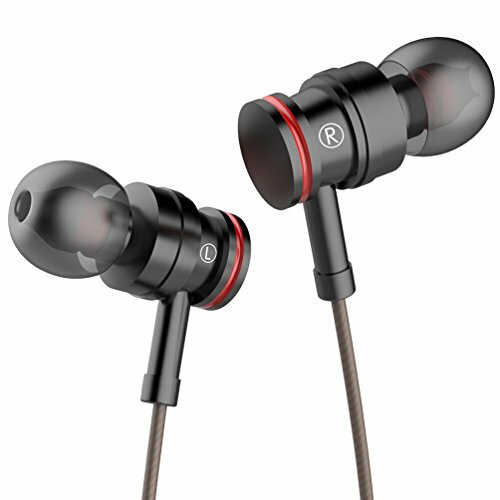 In fact you can get great earbuds for under 50 bucks. 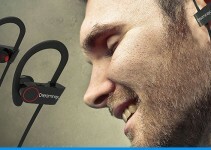 That is what this article is going to look at, the best earbuds under 50 USD. What is their purpose? Do you just want a pair of earbuds for easy listening? To go on early morning jogs? Will you be using it over long periods of time or just a few minutes or hours? What is the best price range for quality that fits your budget? 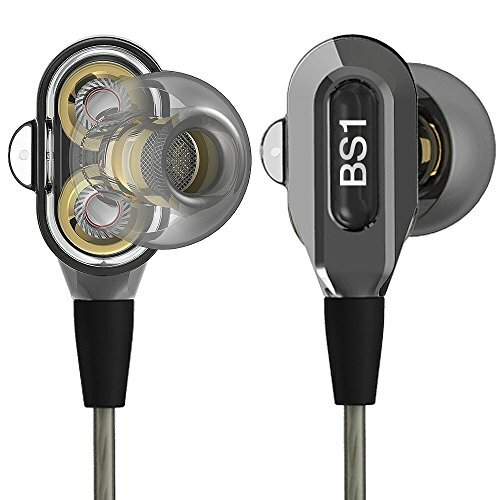 Hopefully this article can make a difference to help you get a pair of the best earbuds under 50 USD that are perfect for you and save you both time and money. Power is packed into this small earbud to deliver clear sounds for your favorite songs and podcasts. With an ergonomic design that is set to fit no matter the ear size, this earbud should stay securely in either ear. Compared to other same sized brands on the market, the F10 has a quick charging time of only half an hour and provides a longer listening time of up to 5 or 6 hours. It also charges through magnetic induction so that eliminates the need for jumbled charging wires when you’re in a rush. The F10 runs on the latest Bluetooth technology and is compatible with all enabled devices. You can connect this earbud from as far as 33 feet away from your phone in an instant. This device is amazing in that it also offers multipoint connection so you can have two mobile phones connected at the same time. 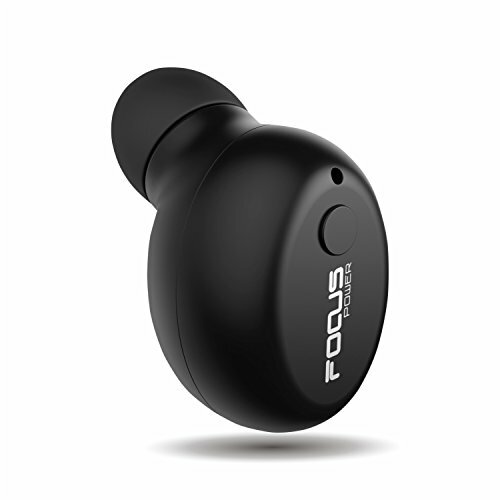 The Focuspower F10 is a waterproof earbud so you won’t have to worry if you forgot it in your shirt pocket when you did the laundry. It’s a great device to use if you’re travelling or jogging because of the amount of playtime you can get from it and that there’s no wires to get in your way as you move about. The only relative disadvantage is that it has a lifespan of about 7 months before it may start to die. If you’re looking for the best earbuds under 50 USD to give you that extra boost in the bass sound, these are a great shot at getting what you want at an affordable price. Able to work with both Android and iPhone, these earbuds from Sony are specially designed to bring out the best in bass that music can offer. 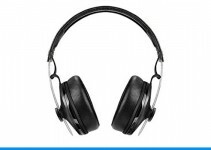 It has a comfortable fit for all ear types so that there is long lasting comfort and a significant reduction of ambient noise. This is a wired pair of earbuds but features a tangle free cable so you spend less time trying to unravel the cord and more time listening to music. These headphones come with a built in microphone so you get great call quality even when the mic isn’t close to your mouth. They aren’t specially designed for sports like some of Sony’s other models but they can still be used while you exercise. The bass feature also makes them a good choice for people in the music profession like producers. With a lifespan of about 3 years, this is a very good choice. Wood has played an important part in music for decades and it becomes even more apparent with these headphones. Compatible with Android and iPhone, these earbuds feature comfort-fit buds from small to large for all ear sizes with a clean acoustic sound supported by a deep bass. A select favorite of many classical music lovers, they come with a built in mic and button controls as well as a tangle free cord with a bold design. They have been known to average out for a lifespan of about a year before issues start to appear like the controls no longer working. Despite that, these earbuds are praised for their aesthetics and are considered a steal for their affordable price. 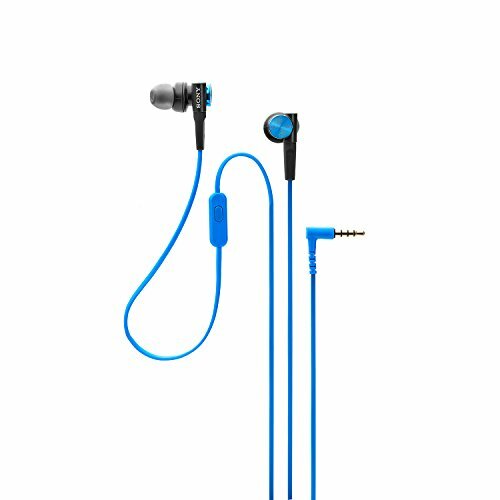 Specially designed to withstand sweat that could damage other earbuds, these are great for people who are active in outdoor sports like hiking and cycling. They charge in about 1 to 2 hours and offer a pretty decent amount of playtime of about 5 hours. 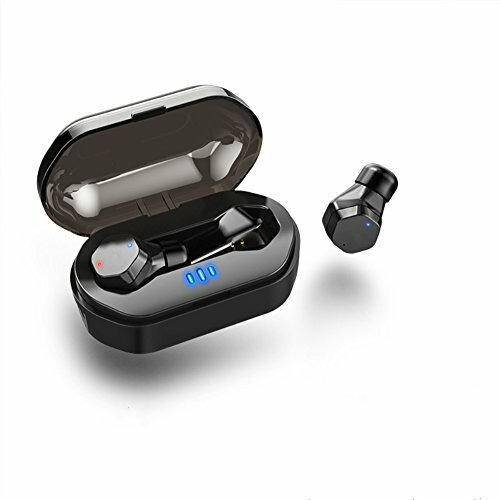 This pair of bluetooth earbuds come with different tip sizes from extra small to extra large so that everyone can get a comfortable fit with the right tip and their magnetic design makes it easy to attach the two buds together and carry them around your neck. 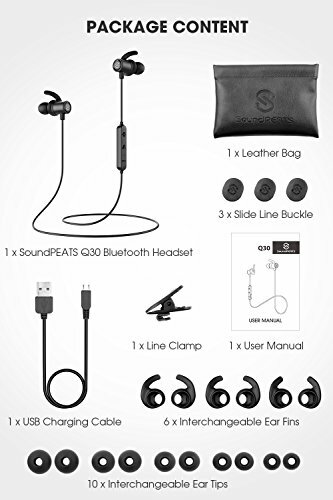 Some people have complained about charging it; that the charging cable is flimsy or it doesn’t charge at all, but otherwise it has great reviews and a number of recommendations if you’re looking for a pair of the best earbuds under 50 bucks to exercise with. 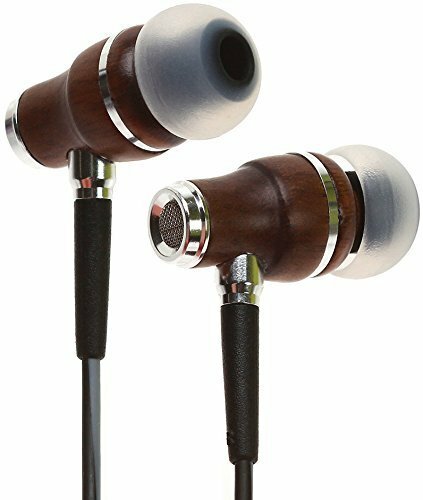 Symphonized is known for their unique wood earbuds to bring out the best sound at an affordable price. These are a lightweight model designed to fit comfortably and come with additional earbud tips in small, medium or large to ensure a custom fit for all ears. These earbuds have a commendable Bluetooth range so you can be about 20 feet away and still get the quality sound you would hear at 5 feet from your device. The in line microphone and built in volume controls make it easy to use your phone even at a distance. 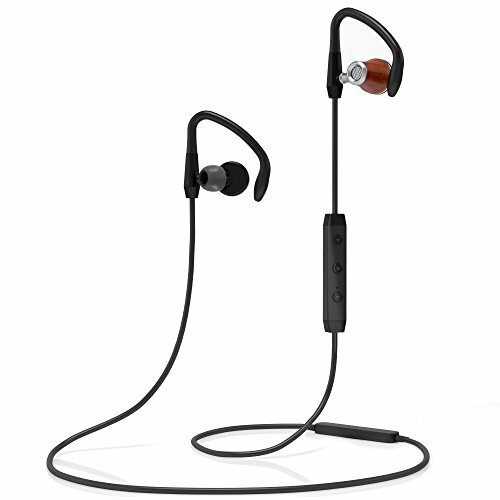 The sleek secure fit is ideal for people who exercise and need a pair of headphones that will stay in the ear while on the move. With only 2 hours of charging time, you can get up to 6 hours of playtime while connected to any Bluetooth supported device. One issue that customers mention however is that the cord is pretty short and even slight head movements to the left or right can result in a bud being dislodged. Otherwise it delivers a flawless sound and is a great pair of earbuds for under $50 with all things considered. This mid-range set of earbuds looks very stylish with a clear inner ear piece made from soft, transparent material and a sleek looking grey and black outer casing. For bass-lovers who are willing to splurge a little bit, this set of earbuds features a magnetic boron drive unit that delivers thumping bass that is unusual for such a small set of earbuds. 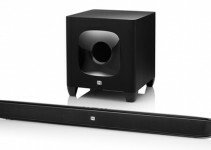 With superb sound, high definition, and ultra-clear midrange acoustics, this is actually a very high value product for the price. A built-in mic allows for hands-free calls on any smartphone. Sporting a comfortable in ear design, this single earbud from Kissral is considered a very snug fit that within only a few minutes of wearing you might even forget that it’s there. The earbud is small enough that it won’t cause ear swelling and it doesn’t attract attention. The earbud is really just one big button control so you can easily access a number of features through the using the multifunctional button. Compatible with most Bluetooth devices, the earbud has a transmission distance of about 10 meters. It even lets you connect 2 separate Bluetooth devices simultaneously and has an average of about 5 to 6 hours of use as advertised. It’s considered a great accessory for its price but the only complaint is that the volume isn’t as loud as expected but it’s still pretty good. With a basic price, these earbuds are anything but. With an array of colors available, the style-conscious can match the earbuds to their iPhone, iPod, Android devoice, Windows phone, or Mp3 player. Black, blue, orange, pink, red, green, silver, and violet are all available. 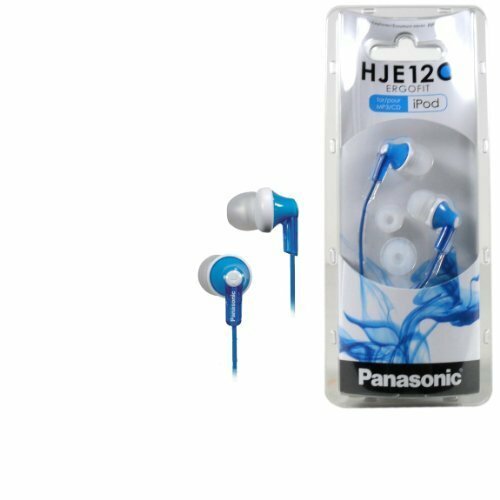 The earbuds themselves are basic, simple, but feature the reliability that you could expect from Panasonic. Three pairs of soft earpads are included to allow the user to adjust the fit to their particular inner ear size. Ergonomic, simple, and stylish are all hallmarks of the Panasonic brand, and in this case: the price is about as low as the budget-conscious music lover can go. The RP-HJE120 ErgoFit Earphones combine sound, fit and comfort to bring a pair of earbuds that are so light that you’d hardly realize they were there while also having different earbud sizes so you get the perfect fit whether you have a small or large ear or anything in between. They offer great sound quality with a wide frequency response that is compatible with most smartphones including Android, Apple and Blackberry. These earbuds are commended for their ability to cancel noise but their disadvantage is that there isn’t much bass if that’s what you’re interested in, and they can’t function to answer calls since there’s no built in microphone. They are recommended if you want to exercise with a pair of durable headphones as many testify to the fact that they stay in the ear and work well. These earbuds from GIKIM are built to give comfort and long term use with an ergonomic design that fits in your ears and is prevented from falling out. 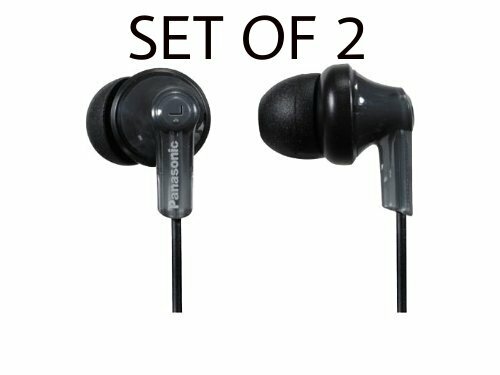 Earbud tips are also included to give you different options in sizes from small to large. The high quality drivers offer a balance between treble and bass for a clear audio experience. They come with microphone and volume buttons to carry out a number of different functions when used in hands-free mode. The cable is tangle free so you don’t have to spend time untangling your earphones and a small shirt clip is also included so that your earbud wire doesn’t get snagged while you play sports. An important note to be made is that all Apple devices from the iPhone 7 and up will need an adapter in order for these headphones to work. Otherwise a great number of customers has said that this is worth its price and they definitely recommend it. Overall, if you’re selecting a pair of the best earbuds under 50 bucks you need to consider what you’re using them for. Keeping it under $50 can be tough if you want the best features or bluetooth functionality. However, it is possible to get a high-performance and reliable pair of earbuds that actually fits your ear size without breaking the bank! Of course, you can always buy a spare pair of earbuds in case you break the first pair, too. Whether it’s music or phone calls, Amazon offers a wide variety of great earbuds for everybody.